Every year on December 10, the anniversary death of Alfred Nobel (1833-1896), the Nobel Peace Prize is awarded during a ceremony at the Oslo City Hall. For the rest of the year, this building, located in the center of downtown Oslo, Norway is open for touring, free of charge. Two tall towers and an enormous clock echo the design of traditional northern-European town halls. A carillon in one of the towers provides the area with real bell-ringing, not the electronic broadcasts of more modern buildings. Rådhuset is the word Norwegians use for City Hall. The word literally means "advice house." The architecture of the building is functional — activities of Oslo City are similar to every city's center of government, dealing with business development, building and urbanization, general services like marriages and garbage, and, oh, yes—once a year, just before the winter solstice, Oslo hosts the Nobel Peace Prize ceremony in this building. Yet when it was finished, Rådhuset was a modern structure that captured the history and culture of Norway. The brick facade is decorated with historical themes and interior murals illustrate a Norske past. Norwegian architect Arnstein Arneberg used a similar mural effect when he designed the 1952 chamber for the United Nations Security Council. 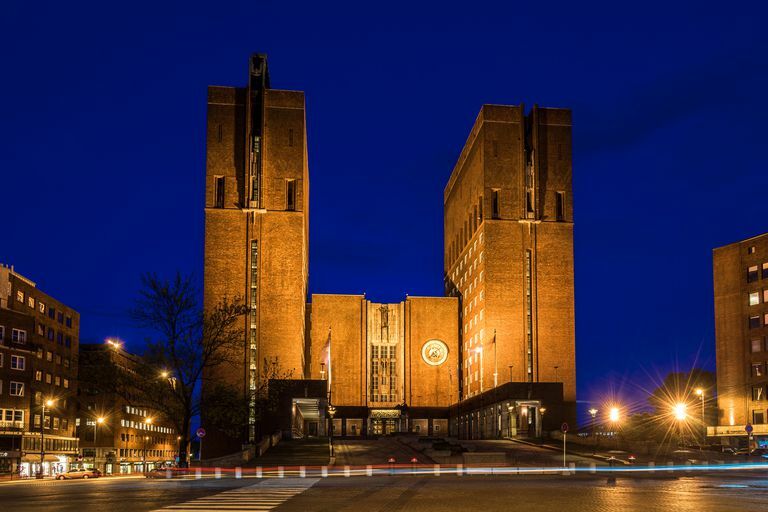 The design and construction of Oslo City Hall spanned a dramatic thirty-year period in Norway's history. Architectural fashions were shifting. The architects combined national romanticism with modernist ideas. The elaborate carvings and ornaments showcase the talents of some of Norway's finest artists from the first half of the twentieth century. The 1920 plan for Oslo called for the "new" City Hall to initiate an area of public spaces on Rådhusplassen. The building's exterior artwork depicts activities of the common citizen instead of kings, queens, and military heroes. The plaza idea was a common one throughout Europe and a passion that took American cities by storm with the City Beautiful Movement. For Oslo, the redevelopment timeline hit some snags, but today the surrounding parks and plazas are filled with carillon bells. Oslo City Hall Plaza has become a destination point for public events, including the Matstreif food festival which takes place for two days every September. The City Hall is the seat of government for Oslo, Norway, and also an important center for civic and ceremonial events such as the Nobel Peace Prize Awards Ceremony. Visitors and dignitaries who come to the Oslo City Hall enter through these enormous, elaborately decorated doors. The center panel (view detail image) continues the theme of bas relief iconography on the architecture's facade. The Nobel Peace Prize Award presentation and other ceremonies at Oslo City Hall take place in the grand Central Hall decorated with murals by artist Henrik Sørensens. Titled "Administration and Festivity," the murals in the Central Hall at Oslo City Hall depict scenes from Norwegian history and legends. Artist Henrik Sørensens painted these murals between 1938 and 1950. He included many images from World War II. The murals shown here are located on the southern wall of the Central Hall. It is this Central Hall that the Norwegian Committee chose to award and honor the Nobel Peace Prize Laureate. It is the only Nobel Prize awarded in Norway, a country that was tied to Swedish rule during the life of Alfred Nobel. The Swedish-born founder of the prizes stipulated in his will that the Peace Prize in particular be awarded by a Norwegian Committee. The other Nobel Prizes (e.g., medicine, literature, physics) are awarded in Stockholm, Sweden. The laurel wreath or laurea is a common symbol found throughout the world, from cemeteries to Olympic stadia. Winners of ancient Greek and Roman athletic games were acknowledged as the best by placing a circle of laurel leaves on their heads, just as we do today for some marathon runners. 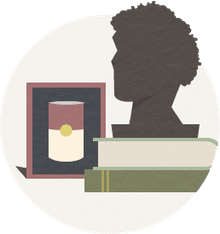 Often pictured with a laurel wreath, the Greek god Apollo, known as an archer and poet, gives us the tradition of poet laureate—an honor that in today's world pays far less than the honors bestowed by the Pritzker and Nobel families. The Pipervika area around Oslo City Hall was once a site of urban decay. Slums were cleared to build a plaza with civic buildings and an attractive harbor area. Windows of the Oslo City Hall overlook the bay of Oslo fjord. One might think that a City Hall would be traditionally rebuilt with columns and pediments, in the Neoclassical style. Oslo has gone modern since 1920. The Oslo Opera House is today's modernism, slipping into the waters like so many icicles. Tanzanian-born architect David Adjaye redesigned an old rail station to become the Nobel Peace Center, a fine example of adaptive reuse, blending traditional exteriors with high-tech electronic interiors..
Oslo's continued redevelopment makes this city one of Europe's most modern. Note: As is common in the travel industry, the writer was provided with complimentary services for review purposes. While it has not influenced this review, About.com believes in full disclosure of all potential conflicts of interest. For more information, see our Ethics Policy. What Are the Top Awards and Honors for Economists?